Home Beers Brasserie de l'Abbaye des Rocs s.a.
Abbaye Des Rocs Grand Cru Belgian Special Brown | Brasserie de l'Abbaye des Rocs s.a. Pours a dark amber brown with a mountainous head, more than 2/3rd of the glass. Nose is spicy, malty, elements of cinnamon and coriander with a slightly sweet fruity character. To call it a "nose" is disparaging -- this beer has a bouquet. Initial taste has a bit of a tang to it, not quite sour but soon yielding to a soft malty sweetness. Flavors of candy sugar, some mild spices, some yeasty tangy elements again covered with caramel and tea flavors. Very, very light cinnamon and lemon rind, very light buttered toast. A symphony of flavors with a lingering spicy-sweet aftertaste. Mouthfeel is soft and fluffy, carbonation keeps a bite to it. Smooth and dangerously easy to drink, no hint of a suggestion of a trace of alcohol, regardless of its ABV. Outstanding, a beer without a flaw. There simply is no way I can score it any less. 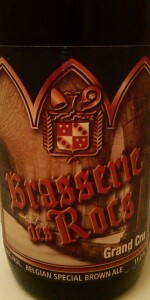 Label says "Brasserie des Rocs," Belgian special brown ale, 9.5% ABV. 330 mL bottle from the LCBO; best before December 13 2014. A random grab while I was shopping; I am always ready to try a new Belgian ale, especially if the price is right. Served slightly chilled, and poured into a tulip. Pours a dark, opaque brown colour with beautiful ruby highlights under the light, and topped with about one centimeter of dense, creamy, beige-coloured head. It's not much to look at, but the head hangs in there for a good long while, thinning out only slightly over the next ten minutes. Rich, malty aroma; toasted, bready malts, cocoa and brown sugar are countered nicely with notes of raisins, dates, nutmeg, and plenty of Belgian yeast. Leans on the sweet side, but not to an overbearing extent. Rather full-flavoured, and not nearly as sweet as the aroma seems to let on. While there is initially no shortage of malt sweetness - bready malts, caramel and milk chocolate come through strongly, as well as dates, raisins, prunes and banana - this is well balanced by the tail-end of the flavour profile. The finish becomes more yeasty, with a burnt molasses/roasted malt flavour coming through, and an earthy, roasty aftertaste that lingers on the palate, along with a hint of anise. Full-bodied, with a chewy, creamy mouthfeel assisted by the restrained-yet-lively bite from the carbonation. Soft in the mouth, leaving a somewhat sticky, vaguely hot feel behind from the ethanol. A great sipper; something I'd probably reach for again in January, though to be fair it's drinking nicely on a cool July evening. Final Grade: 4.34, an outstanding A grade. Abbaye des Rocs' Grand Cru Belgian Special Brown Ale is an excellent strong dark ale, and in my opinion it's a total steal at its LCBO price point ($3.00/bottle). I don't profess to be an expert as far as BJCP style guidelines go, but from a personal subjective standpoint, I am looking for four things from these types of beers - bold, complex malty flavours; lots of fruity, Belgian yeast esters/spice character; a full body; and well-integrated alcohol. This isn't the most complex Belgian ale I've ever had, but it still tastes great and is balanced beautifully. Highly recommended to any fan of Belgian sippers. A: chestnut brown with an off-white half finger head that dissipates quickly. Light lacing. Lots of floating fermentation. S: dark fruits, caramel, Belgian yeast. T : Follows nose with plums and raisins. Bready malts, banana nut bread with hints of chocolate. Sweet,robust. A Belgian delight. M: medium with heavy carbonation. Thick, frothy. O: Worth the $5 price tag. Will definitely drink again. A great celebration sipper. Pours a cloudy brownish red with a nice, creamy beige head that pours big and settles to a healthy cap. Great retention; some lacing. Lots of spicy yeast aromas. Rubber, leather, over-ripe bananas, baking spices, bubblegum, and some earthy floral notes. Soft, delicate, and sweet. Immediately sweet with dark fruits, syrup, and earth herbal aromas; slightly bready with the yeast making it really filling, spicy and full. Amazingly velvety and smooth. Medium to full bodied with good carbonation and a luscious feel. Slightly coating with a lingering pleasant aftertaste. Nearly perfect. Really nice, 'together' flavor that I would expect from a random Belgian beer whose name I had heard of before. The beer pours lovely and has an incredible nose on it with tons of yeast character. The flavor is very whole and pleasant and the palate is to die for. WILL have again; worth seeking out. Look: Dark brown body with red hues. Frothy white 4 finger head. Smell: Dried cherries, juicy red apples, black tea, classic spicy Belgian yeast, sugar, slight funk, malt, honey sweetness and alcohol. Taste: Cherries, nutty, caramel, roasted notes, sour apples, no alcohol taste just a warming finish. Feel: Medium body, soft carbonation. Overall: This is recommended. The aroma to me is the showcase of the brew. The flavor is well balanced but not as interesting as the aroma. Will have this again further down the road. Great foamy ale. Serving developed a large head, and it remained there for some time. Scent was very sweet, with dried fruits, and molasses. Tasting revealed a very, very sweet beer. Mouth feel was a bit thin, I expected this beer to be syrupy since the nose was so sweet, but on the contrary it was well balanced. Could drink more than one pour. When opening, this beer gushed out a bit. My hand was very sticky. Also, this beer had some sediment that looked like cinnamon or nutmeg. Appearance: Hazy deep mahogany brown, with a small tan head, which quickly fades away. Thin fine-beaded lacing coats the glass walls. Aroma: Sweet vinous alcohol and dark fruit dominate the aroma. The aroma is profound and almost brandy-like. Taste: Opens with toasted grains hebal hops, and moderate sweet alcohol. As the taste progresses, moderate herbal hops asset themselves. Later in the taste, dark fruits appear, in particular, figs. Late in the taste, there is also a faint wave of vanilla and wood. Finishes with a long, lingering, but mild hop presence, and sweet alcohol. Mouth feel: Smooth, soft, full, and very pleasant. Drinkability/notes: Very nice, a worthy effort. Presentation: Packaged in an eleven point two ounce Euro-style brown glass long-neck bottle, served in a New Belgium chalice. I got this as a single at Union Jack's on the Manatawny. I drank it in a goblet. Expiry date of 2008(!) stamped on the label. Label also tells me to drink it @52-56degrees, and to drink it in a tulip glass (which I don't have). Pours a cloudy brownish red with big chunks of yeast floaters. Looks like the real McCoy! A huge four finger head of beige colored foam forms on top. The head eventually falls to a nice coating and a ring, with excellent lacing all the way down. Aroma is a very complex combination of chocolate, coffee, molasses, burnt brown sugar, apples, cherries, cinnamon, nutmeg, yeast, and Belgian funk all rolled into one. Can't wait to taste it! Yeasty/funkyness increases as it warms. First flavor is (WOW) sweet, dark, burnt malt, then the dark fruits like cherries, plums and dates, followed by a slight phenolic, way in the back. Spices like cinnamon, nutmeg, pepper, and allspice bring up the rear. Aftertaste is fruity, spicy, sweet, and a little warm. Fantastic! Flavors improve as it warms, even though I started to drink it @ 55 degrees. Mouthfeel is full bodied, smooth and creamy, with a pretty good zing in your mouth from carbonation. Lips stick together from sweetness. Fantastic burps!. Finish is sweet, sticky, and warm. I can't wait to get to UJ's for another one of these. This is a truly awesome beer, well worth the price of admission. I hope I can get it in a 750. 750 ml bottle; label says best buy 14/03/11. Phew...just in the nick of the time. A: A nice, dark brown color with a thin head and...massive chunks of yeast. Was this beer supposed to be strained? S: Sweet, malty, caramely goodness with a hint of dried fruit. T: Taste is good, follows the nose with a sweet, tad smokey flavor and that Belgian yeast. No sign of hops. Finished very smooth. M: The yeast is actually not bothersome when drinking. I didn't really notice it. Decent level of carbonation. D: Alcohol is very well hidden - do not taste a sign of it (until I stand up). Finished half of the 750 very easily and could've had more. Overall, a very good beer but does not really stick out as a top-notch Belgian dark ale compared to others at the top of the style. Poured a cloudy, yeast infused ruby-brown. Strong aroma of malt and fruit, with a nice hoppy backbone. The seven malts and three hop varieties blend richly, yielding a delicate but aggressive balance of sweet and sharp tastes. Fruit fills the mouth on first sip  the raisin, date and plum variety  and then settles to a pleasant but subtle smokiness. Velvety mouthfeel, pleasant for sipping, and definitely drinkable. Figured a white wine glass would be good for this one. Pours a murky, boggy red color. This one gushed a little, so there is plenty 'o head. Notes of white sugar, figs and green grapes. Also get some Belgian yeast funk. Whoa, this beer is complex...where to start? Definitly get classic Belgian yeast and malt flavors. Carmel with hints of toffee, red apples, rotting tree logs and wheat pasta. The more I have of this, the more I like it. Very interesting brew. Recommeded trying this beer at least once. A bit pricey. Aging is a near must with this one. Holy crap I have so many reviews to catch up on. This was my first brew on my trip to New York; had this on-tap at the Old Toad in Rochester, served in a pint glass. Pours a very dark, amber-like brown with a reddish tone to it (depending on lighting). Off white head is extremely thin with no retention or significant lacing. Looks just alright. Aroma is strongly of estery fruit and yeast qualities, including caramel and a little breadiness. Flavor is similar - lots more yeast with malty sweetness, some fruit in the vein of tart apple, a little spice, a slight note of some dark fruit. There's an overlying bite to the drink that's kind of surprising. Mouthfeel exhibits good carbonation, medium body, a longer finish that isn't all that dry, and a bready aftertaste. All in all, it's just alright for drinkability. The taste is respectable but it's not all that inviting from the get-go and probably not worth a revisit from me. One positive note - had no clue this was 9.5% until just now. Very little abv presence in this drink. Abbaye Des Rocs Grand Cru was served from a green 750 ml bottle into a Duvel tulip. The beer was an attractive deep reddish-orange hue and was topped with a rocky tan head that left thick and fine lacing. The nose was powerful and loaded with funky spices such as clove, star anise, and orange peel...an overall medicinal effect. Underlying the spice was a smell resembling decaying detritis and earth. The flavor profile was extremely complex. A rich and lively sweetish malt body contained flavors of dried fruit, raisins, molasses, scotch, and slim jim spice. The finish was satisfying, with a good bitter cap and lingering clove maltiness. The body was very full and silky smooth, with fluffy carbonation. The Grand Cru was a challenging beer, and grew on me by leaps and bounds as I drank and acquired a taste for it...distinctive, unique, and very complex. I found it similar to the regular version in its flavor/spice, but much better overall. Pours a super cloudy amber/ dark orange... quite dark orange. Too much carbonation, as I had to really let this one settle after a gentle pour. Nice eggshell head with some good lace after it calms down. Some floaties in there. Sweet in the nose. A little banana/clovelike. Good flavor, but nothing special. Actually quite 1 or 2 dimmensional. Sweet banana/clovelike with maybe a touch of candi. Full bodied and highly carbonated. Dry enough but the sweetness is still there. Almost cloying. Allowed bottle to warm out of the fridge for about an hour. Pours cola-brown with a big foamy tan head. First impression: Medium body. Tastes grassy/earthy, woody?, sweet. Dark fruit like figs or prunes. Has a well-worn flavor - earthy/leathery. Reminds me a bit of Westvleteren. Medium acidity leaves a thinner lingering high-note finish. First rate pour of light brownish leather settling as a dark caramel brown with a slender reddish tone, dusky thick and opaque with tons of yeasties suspended within the murk. Head grows tall and fast of tannish fluff to a fine velvety smoothness becoming rocky and crusty as it begins to melt down which takes a good amount of time before finally a full haze on top and thickly fluffed collar sticks around the edge. Lacing is in sparitic globbuels. Aroma is appetizing and soft with spices; delicate and easeful with a sufficient showing of lemon tea cookies and lemon and orange zest with small notes of giniger and cinnamon. Has some notions of dark caramel surfacing from underneath on big wiffs plus some yeast, phenolic, and warm alcoholic notes. More of the yeast and phenols come through as it warms, big time. Taste is very complex and incerdibly inticing. Whew, what a mouthfull of things going on here. Simply amazing and fine with nothing to overpowering really other then the alcohol hitting fast as it goes down very nicely with a smooth zesty fullness that begins to make your head swoon just after half a glass and there's yet a whole nother serving in that 750ml bottle yet to come, oh boy...a long night ahead. Flavors are quick to enter with sharpening tones of citrus zest from lemon and orange with some light pineapple, white grapes, dulled grapefruit, and sweet mango inscribed within the mix along with small added notes of yeasty spicyness with kinda of a peppery, clove, nutmeg, citrus peel zest thing. Lots of zest! Lots of softened spicyness. And what makes it even more remarkable is there seems to be a very nice dark malty sweetness of toffee/caramel that kinda keeps those spices from getting out of control and too strong. Beautiful medley of flavors that intermingle and dance with each other in perfect harmony. Full bodied feel with a bit of sharpness and yeastyness that takes away just a nudge for me, but not by much. So goes the feel so goes the drinkability, in most cases anyways, and it does with me with this, by just another nudge mainly due to the untraceable alcoholic effect this has and smallish sharp tone of zest and yeast. But damn this is some very good stuff! Thank you very much ManekiNeko!! A- Poured into a chalice. Pours a dark brown color with a light tan colored head. After having a few other beers from this brewery in the past, I am not surprised to see a lot of yeast floaties in the glass. It takes some time getting used to the floaties, but their beer is so damn tasty it is easy to get used to. S- The aroma litteraly made my mouth water in anticipation of tasting it. There is a ton of malt in the aroma, dark fruits, brown sugar, caramel and yeast. T- The taste like the aroma is very malty with some caramel, brown sugar and a hint of alcohol in the finish. M- The mouthfeel is somewhere between light and medium bodied with a good amount of carbonation. D- This one is pretty damn drinkable for a beer pushing 10%. Overall, another solid beer from this wonderful brewery that is highly recommended. Aroma: Rich fruity malt, full of raisins and plums and a perfumed alcoholic note that blends it all nicely. Flavor: Firm alcoholic note but not hot. Malt fruit note is pure and simple, Im guessing Special B and candy sugar in the brewing. There is a mild bubble gum note as well. There is an earthy quality as well, like sugar beets. Definite Belgian yeast quality lends it a Trappist air. Mouthfeel: Lively without being fizzy, thinner body from the alcohol, lingering finish. Overall Impression: A tasty beer. Im a little disappointed that I let it go so long and let it go all lava lamp on me. I guess I was waiting on a special day. Turned out it was the first day back at work for Fall 07.
pours heavy, dark brown caramelish. lots of sediments!! this is a damn good beer. dark, heavy malts, complex finish, high in abv but not even noticable. doubleish tastes pure quality. drinkability very high, mouthfeel great. this is probably the best of this particular style ive had yet. Sampled at Lucky Baldwin's in a Moinette glass. Here's the kicker.. the keg has been in storage since 1998. Woo Hoo! Glass is filled with a deep brown liquid with light red highlights and almost no head. Aroma is leather, sour cherries, brown sugar oxidation and tropical fruits with a sweet punch character at the finish. Flavor is deeply spiced with a light malt and brown sugar and a long ground spice mixed with pineapples, mangos, guavas and oranges. The finish finally comes with a light sourness to cleanse the palate for the next sip. As David Farnsworth (owner of Lucky Baldwin's) put it, "This is liquid heaven, is there anything better?" My only response is "Yup.. to be having it in Belgium." Heigh thee forth to Lucky's and get a sip of this, but if you don't do it soon David will have drunk it all. Jeez.. my first 5. This came in a 11.2fl.oz. brown bottle with a Best before end (what looks like) 2007. It pours into a semi-tulip 13.5oz. a dark murkish hazelnut brown with a solid, tight 2-finger tan head that lasts. Some thick lasting lace left stuck to the glass as you drink. The smell is of thick, chewy malt and caramel...sweet and very malty, nice strong aroma of unhopped wort...sticky sweet. The flavor can best be classified as a "Malt Bomb" in that it is very sweet and thick, almost malt syrup like. This brew is just about the opposite of a "Hop Bomb", although there are hops that manage to tame the sweetness quite nicely. Just a big, fat malty brew that is very tasty and fairly strong as well. The body is massive, thick and chewy, with a good smooth mouthfeel and the right amount of carbonation to give this strong ale a good drinkability...the alcohol is well burried in the malty thickness. A good solid drinker that deserves a try for this style...another unique Belgian for sure. Abbaye Des Rocs Grand Cru Belgian Special Brown from Brasserie de l'Abbaye des Rocs s.a.